I’m about to hit you with some winter-time Tiki action, a drink that manages to feel like summer and winter at the same time. Long-time readers may remember a similar experiment all those years ago in which James and I paired parsnips and pears, but today we have pared this concept down to pearfection and we hope it will be apparent to you. This tiki mug is one of my favorite pieces in my bar because it is so shamelessly gaudy. Tiki mugs are intentionally opaque, because most of the best tiki drinks are ugly, cloudy, swamp-brown colors. This is the price you pay for emphasizing flavor over appearance. For this drink, I didn’t want to be burdened by the aesthetics of the liquid itself. I have never been a huge fan of pears, but there is a particular variety of pear called the Comice, or Christmas pear, which has a soft, custardy flavor and a pale green skin which, in ideal conditions, will exhibit a bit of blush. You can see it on the slices in the photograph. This type of pear is a hidden gem in all of the winter harvest. Its texture is like a ripe peach. I skinned such a pear, removed the seeds, and turned it into a smooth puree with a hand blender. To be honest, the parsnip did not come through as much as we were hoping. An attempt to juice parsnips revealed that parsnip juice is a shockingly expensive ingredient per ounce, not even remotely practical as a cocktail ingredient. Instead, we tried caramelizing parsnips and then simmering them into a syrup with honey. It “worked” in the sense that there was a caramelly winter spice flavor, but there was nothing discernible as parsnip, per se. To this I added light rum, fresh ginger juice, and prosecco, all over crushed ice. The prosecco did not keep any of its effervescence, of course, with so much crushed ice and pulpy pear puree, but its acidity and its flavor brought the balance to the otherwise sweet flavor profile of this drink. Shake and pour over crushed ice into a tiki mug. Garnish with Grated Tonka bean. 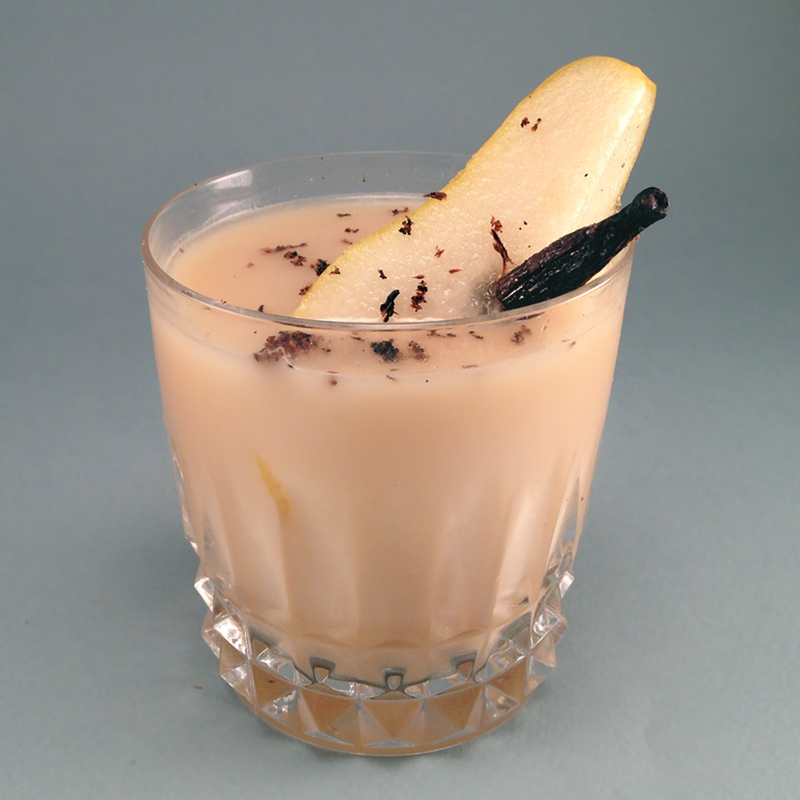 As delicious as that combination is, what really makes this drink stand out is an unusual ingredient called Tonka bean. Tonka beans are illegal to serve in the US, because they contain a high concentration of a chemical called coumarin, which has been shown to be toxic to the liver when it is fed to rats in quantities equal to their body weight. (Side note: Some types of cinnamon, specifically canela has a similar concentration of coumarin. No one has died from it yet, as far as I know). Many thanks to the FDA for saving us from this dangerous, and delicious spice. Its aroma is like dried cherries, vanilla, gingerbread, and cloves, and yet there is nothing quite like it. I was able to buy some on ebay for a few dollars, and it came with a label warning me not to eat it, and a note about their use in “voodoo magick”. If that’s not Tiki, I don’t know what is. This drink is named after a Chinese gangster who was active during the romance of the three kingdoms. When I read the story of this man, I knew instantly that I had to make a tiki drink that bore his name, and the “poisonous” Tonka bean was the perfect addition to drive home the theme of “Poison Yu”. Categories: modern drinks, original creations, tiki | Tags: booze, christmas pear, cocktail, cocktails, comice pear, drinking, drinks, ginger, ginger juice, parsnip, parsnip syrup, pear, prosecco, rum, seasonal, tiki, tonka bean, winter | Permalink. A trip to the Chinese market yielded up all kinds of treasures, not least among them a pair of Ya Pears, a pear cultivar grown in Northern China. Its peel is almost white, and it has a light, floral flavor on top of the more usual pear notes. We juiced one towards the end of our most recent mixing session, and I did not have a strong idea of what to do with it. I remembered that pear goes well with white wine, so I haphazardly mixed up equal parts of the ya pear juice with cocchi americano. It was a surprisingly good ratio; the light flavor of the pear had room to breathe. Shake over ice and double-strain into an old fashioned glass. Cut a pear to fit perfectly in the old fashioned glass, and chill it in the freezer. Drop it into the glass. The floral aroma from the Ya pear was surprisingly potent, giving the drink a much more fragrant nose than I had anticipated. It served to highlight the distinctiveness of this particular cultivar of a pear; an unexpected slam dunk. In the recipe above, I wrote .5 oz of Benedictine, though when I made this drink at game-time we used .25 oz. I really liked the hint of cinnamon and brandy from the Benedictine, both of which go well with the pear, but they were too subtle, so I increased the amount for the final version. Categories: modern drinks, original creations | Tags: alcohol, bartending, benedictine, booze, cocchi americano, cocktail, cocktails, drinking, drinks, fortified wine, Kina, liquor, mixed drinks, mixology, pear, Pear Juice, Quinquina, White Wine, Ya Pear | Permalink. It is gastrophysics* week here at Measure and Stir, a week in which we make drinks using unusual flavor pairings suggested by molecular gastronomy. The idea is that if ingredients have chemically similar aromas, they will probably taste and smell good together. Some of our experiments turned out better than others, but I think this one was probably the best of the bunch. 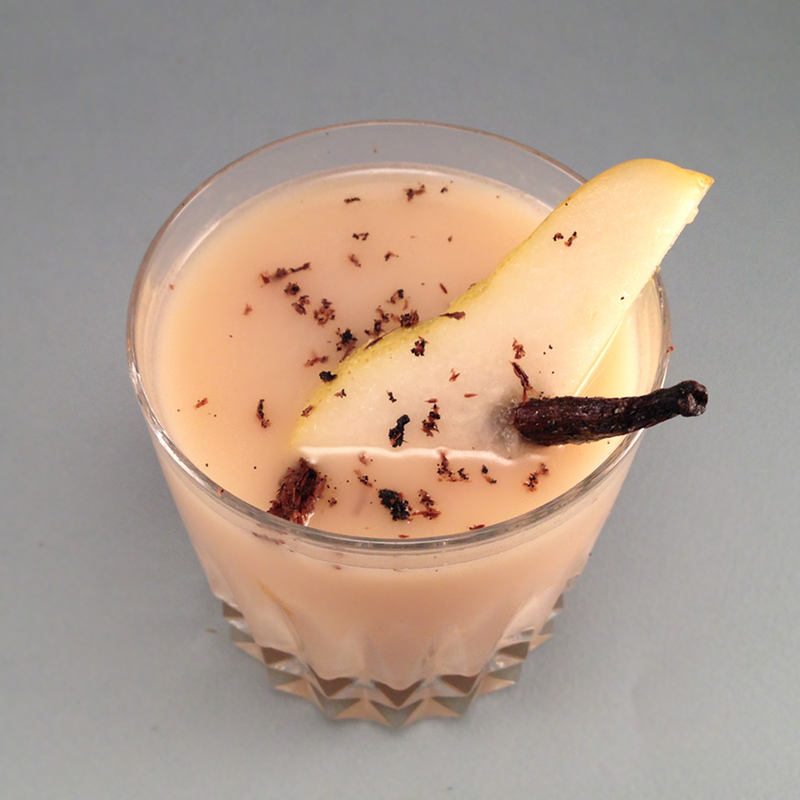 It helped that we started with an excellent base, namely, pear and vanilla-infused brandy. To make the infusion, I chopped up a bartlett pear, and infused it in one cup of cognac along with a tablespoon of cane sugar and a filleted vanilla bean. After three days, the infusion was ready, and thoroughly delicious. 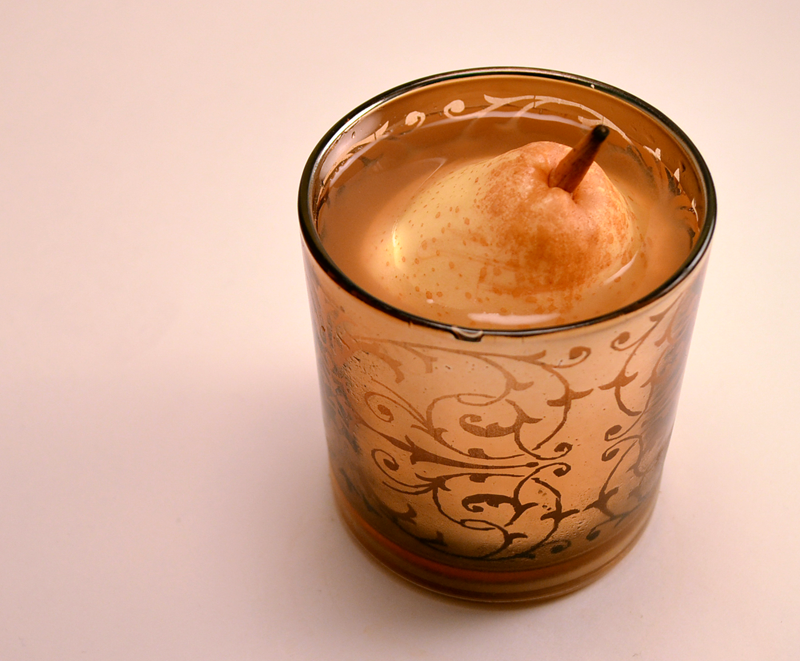 In my experience, brandy is the best spirit to combine with pears. This was one of the best infusions I have made, and I really wanted it to be the star of this drink, so I started with two ounces of the pear-infused brandy. Parsnip juice has a very light flavor, but it is sweet, much like carrot juice. Indeed, I often think of a parsnip as an albino carrot. I found that I had to add two ounces of parsnip juice to balance it against the brandy. That combination was delicious on its own, but it still needed some acidity to add interest upon the palate, and lemon is less disruptive than lime or vermouth. Half an ounce of lemon was just right, along with a touch of brown sugar syrup, to bring out the parsnip, and two dashes of grapefruit bitters, for depth. I cannot explain that last decision, it just felt right. Shake over ice and double-strain into an old fashioned glass. Garnish with pear wedge impaled on vanilla bean, and grate a little bit of vanilla bean over the top. Ordinarily I am opposed to grating anything over the top of a drink, lest the small particles disrupt the texture of the drink. Nutmeg and cinnamon work in this format, but lemon or lime zest are unpleasant to imbibe, in my opinion. I was on the fence about the vanilla bean, but we ran it over a microplane grater and it was surprisingly flavorful and unobtrusive. Until next time, keep it craft. Categories: infusions, modern drinks, original creations | Tags: alcohol, bartending, bitters, booze, brandy, brown sugar, cocktail, cocktails, cognac, craft cocktails, drinking, drinks, flavor pairings, garnish, grapefruit, grapefruit bitters, infusion, lemon, liquor, mixed drinks, mixology, molecular gastronomy, molecular mixology, parsnip, pear, vanilla | Permalink.